Readers of NLM will definitely want to have a look at the latest of the Position Papers commissioned by the Foederatio Internationalis Una Voce. The new Positio -- number 17 in this already classic series -- is entitled "The Reception of Communion Under the Species of Bread Alone in the Extraordinary Form." Far more than a treatment of the issue as it pertains solely to the usus antiquior, it manages to pack a short history of the communion under both kinds, a summary of the benefits of communicating under one kind, an analysis of problems connected with distributing the chalice, and even, in three appendices, a consideration of how sacred vessels should be handled, hygienic problems, and the implications of celiac disease in the EF context. Under the liturgical laws pertaining to the Extraordinary Form, the Faithful may not receive the Precious Blood, but only the Host, by contrast with the widespread practice, at least in Europe and North America, in the Ordinary Form. Historically, the Faithful received the Precious Blood in the West through a tube or fistula, until this died out in about the 12th century, with certain exceptions. Sacrosanctum Concilium proposed a revival of this exceptional reception of the Precious Blood, although permission soon became more general. The practice of the Extraordinary Form has certain advantages. 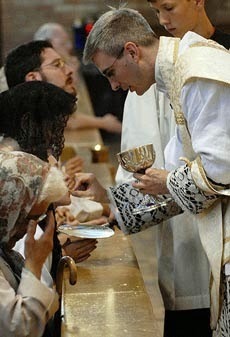 It underlines the sacrificial nature of the Mass, for which the Priest’s reception from the Chalice is ritually necessary, but the Faithful’s is not. It safeguards the respect for the Sacred Vessels characteristic of the Extraordinary Form, which is incompatible with the usual practice of the Ordinary Form. It avoids a number of practical difficulties and liturgical abuses which have sometimes arisen in the Ordinary Form. And it guards against certain dangers to public health. Go here to read the entire paper, and here (Joseph Shaw's blog) for further commentary.